In this episode, the latest enemy turns out to be so stupid that only Tagiru and Gumdramon are any match for it- a Digimon cosplayer. Looking like Tailmon is an appropriate coincidence. We all loved Tailmon in Adventure, and one of the biggest reasons is her life before meeting Hikari. We saw her travels with Wizarmon and her torturous servitude under Vamdemon, which gave her a full story arc even though she was only a proper partner Digimon for a short time. Until Xros Wars came along, she was the only partner Digimon where we got a proper backstory of a time before she bonded with a humans. It was a welcome part of Xros Wars as understanding where the likes of Shoutmon and Ballistamon came from improved their stories. There's no expectation of that now, with the Digital World in safe-ish hands and all the action concentrated in the human world/DigiQuartz. But we suddenly get that with Gumdramon, and wouldn't you know it it's one of the coolest things Hunters does. 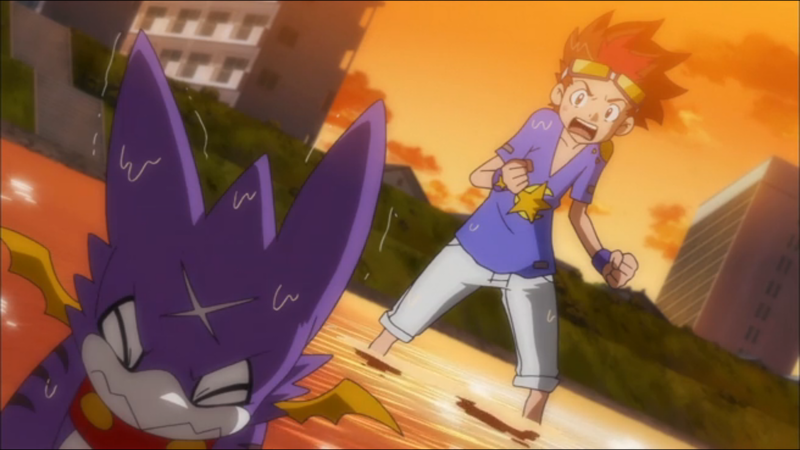 Gumdramon didn't suffer the way Tailmon did. He actually seemed to be quite happy as a chaotic neutral- beating up robbers and police alike and treating the Digital World like his GTA savefile. Betsumon was his accomplice, and despite totally bailing on Gumdramon and not remembering him now, Gumdramon has a feeling of loyalty to him. Just as importantly, it's a reminder of how he differs with Shoutmon. While Shoutmon is about uniting the world and keeping his subjects happy and being everything a good king needs to be, Gumdramon is still trying to make his mark on the world. While he admires Shoutmon, he has no desire to emulate him completely. Betsumon showing up is a throwback to the good old days when he was free to be anything he wanted. That's not the case now, where his hunting work is done under Shoutmon's watch and, thanks to Taiki monitoring Tagiru, under Shoutmon's terms. His terms dictate that Betsumon is a fugitive to be hunted. It's understandable for Gumdramon to resist that judgment and rebel, and this twist is almost worth putting up with Betsumon's presence. After failing in a joint effort with Team ARR thanks to poor communication and Airu deciding she'd rather flirt with Yuu than actually help, Shoutmon insists that Gumdramon helps. But this is a job for a human partner, and Tagiru gets that. So Tagiru absolutely punches Gumdramon in the face. And frankly, it's the best damn thing he's done all season. Much as we malign him, this is a kid who at least realizes that he's not the smartest or most capable, but he's honest with himself. And he knows that the only thing that's going to fool people into thinking he's a credible hunter is an honest bond with his partner. Of course he's going to be furious that Gumdramon isn't being honest with him, because it's all he has. He has to make his partner open up and admit that he can't forget Betsumon, and the direct approach is the only thing these two idiots understand. We see plenty of cases where a kid is going through a problem and their Digimon partner lifts them out of it. Tagiru is one of the few who ever does the reverse. Hey, random Haruki/Ken/Noboru sighting! They show up just to get pantsed by Betsumon. I'm starting to like these guys. Also, stop for a moment and realize that Tagiru wanted to hunt Omegamon. It feels like the terrible puns are worse when the language barrier doesn't get in the way of understanding them. Like we're somehow insulated from their destructive powers because we couldn't figure out why he riffed off Koto or something. Maybe that's why we cringed so much at Taiki's visual aids at the end. Aww, Yuu's trying to offer a psychological explanation as to why the characters fall for Betsumon's terrible costumes instead of it being a lousy plot contrivance. Good effort, Yuu! Harpymon was not a terrible backup choice to pursue Betsumon. It really only lost because Yuu insisted on getting himself and Airu out of the way. 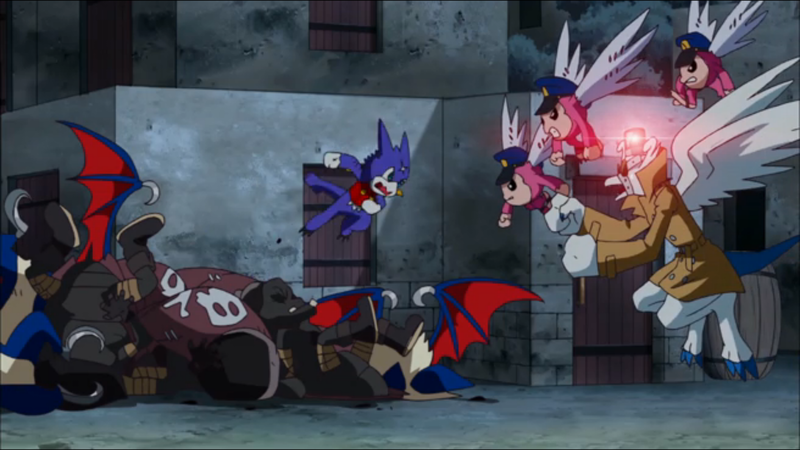 While Gumdramon's backstory is appreciated, and his gold ring even helps explain why he was looking for a patsy partner in the first episode, Gokuwmon and Sanzomon are totally out of left field. They're clearly inspired by characters from Journey to the West and thus we're supposed to treat them with a degree of reverence. But you know else is inspired by that story? Cho-Hakkaimon. It's sort of refreshing that there isn't a long sob story about humans getting pulled into DigiQuartz to do an evil Digimon's bidding. Betsumon just rounds up a bunch of folks to sew his costume. Granted, that method of assembly does make you question how Betsumon gains additional power cosplaying Examon. 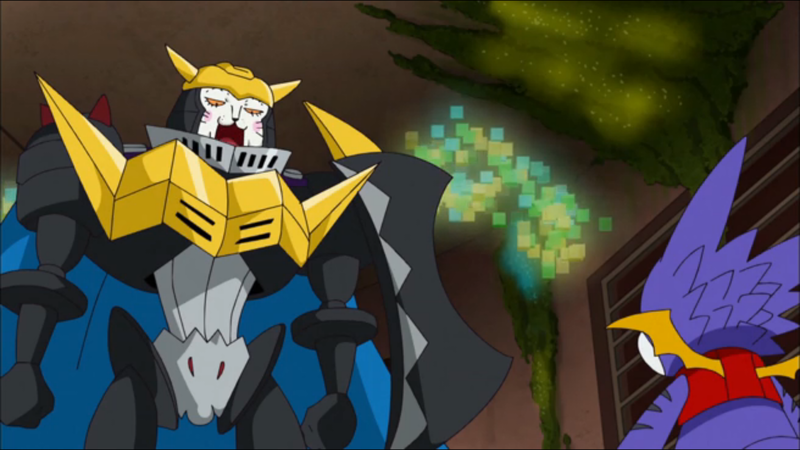 DarkKnightBetsumon was the best part of the episode, particularly due to Airu and Yuu's reaction to him, ESPECIALLY Yuu who makes a point that he knew DarkKnightmon personally so seeing this is...kind of awkward. Ah yes, Betsumon, the one and only character in Hunters that makes Tagiru look good by comparison. He may be good for Gumdramon's character development, but is there seriously anyone who likes him personally? There's no denying Betsumon is an irritating weirdo with an unpleasant design, but he's not the only character worse than Tagiru. Quite a few of the supposedly sympathetic kids in Hunters (next episode's, for instance) give him a run for his money.